No matter how large your hard drive is, the data will grow to fill the disk! Recently I was running out of space on both of my internal 120Gig and external 320Gig HDD. I don’t have any clue on what to delete I have tried CCleaner to delete the history to save some space. I downloaded a beautiful app called WinDirStat. A picture is worth a thousand words. 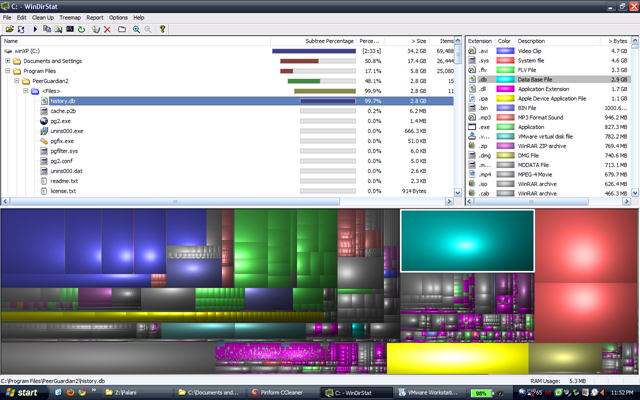 WinDirStat (WDS) is a disk usage statistics viewer and cleanup tool for Windows. It shows disk, file and directory sizes in a treelist as well as graphically in a treemap. It helps you to identify the files by it size and you will be surprised. Based on your need you can free the space.